Support for all popular ODBC Drivers: mxODBC includes adjustments and work-arounds to support MS SQL Server Native Client (both on Windows and Linux), MS SQL Server ODBC Driver, FreeTDS ODBC Driver, Oracle Instant Client ODBC Driver, IBM DB2 ODBC Driver, Sybase ASE ODBC Driver, Netezza ODBC Driver, Teradata ODBC Driver, PostgreSQL ODBC Driver, MySQL ODBC Driver, .MaxDB ODBC Driver as well as the ODBC driver sets of EasySoft, DataDirect, OpenLink, Actual Technologies. Stable, robust and reliable: the mxODBC API has been in active production use for more than 10 years. Adjustable .paramstyle: mxODBC supports both the ODBC question mark positional parameter binding style as well as the named parameter styles used by e.g. Oracle. Supports Python 2.7 memoryview objects. Multi-Version Python Support: mxODBC works with Python 2.4, 2.5, 2.6 and 2.7. Full 64-bit Support: mxODBC runs on the following 64-bit platforms natively: Windows, Linux, FreeBSD and Mac OS X. 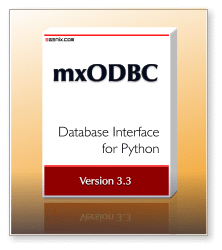 The low-cost Standard Edition License allows installation of mxODBC for use in one Python installation. Depending on the edition variant, it allows working with MS SQL Server, Oracle, IBM DB2 or Sybase ASE database backends only. The maximum number of connections per process is limited to 10 connections. If you are intending to upgrade from an existing mxODBC license to the new mxODBC 3.2, please contact the eGenix.com Sales Team with your existing license serials for details for an upgrade discount coupon. We will give out 20% discount coupons for upgrade purchases going from mxODBC 2.x to 3.2 and 50% coupons for upgrades from mxODBC 3.x to 3.2. After upgrade, use of the original license from which you upgraded is no longer permitted. Please note that upgrade coupons are not available for the low-cost standard editions. If you are looking for upgrades to your existing mxODBC Developer CPU Licenses or mxODBC Product Development Edition Licenses, we will provide you with upgrade coupons. Please contact eGenix.com Sales Team with your existing license serials for details for an upgrade discount coupon. Please note that we have changed the licensing scheme for mxODBC development licenses to a per-developer and product based one in 3.1 and later, to better meet our customer's requirements. If you have questions, please contact the eGenix.com Sales Team. We have successfully tested mxODBC with iODBC 3.52.7 and unixODBC 2.3.1.